Find your nearest defibrillator in Frome, by clicking this link. Frome has a network of public access automated external defibrillators (AED) for use in cardiac arrest situations. Sudden cardiac arrest accounts for around 100,000 deaths in the UK each year of which 60,000 occur in the home, at work or when out-and-about. 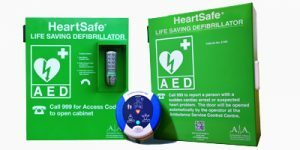 Having numerous public access defibrillators across the town means there will always be one nearby in the event of a life-threatening emergency. You can find the location of defibrillators in Frome and further afield through Heartsafe at www.heartsafe.org.uk/AED-Locations. Knowing the location of your nearest defibrillator, both at home and at work, could help save a life. Take note of where defibrillators are near you. The “Save a Life” app by NHS South Central Ambulance Service can also allow you permanent access to defibrillator locations on your phone, and can help you out in an emergency.